As a kid the obligatory school visit to Washington DC was to tour everything big: US Capitol, Lincoln Memorial, and the big white house on Pennsylvania Avenue with not one plaid lawn chair out front. 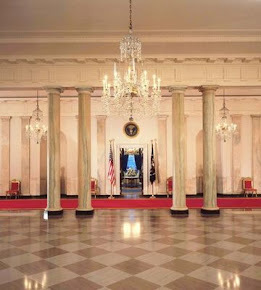 To enter the White House first through the East Lobby entrance - white - and into a wood paneled foyer. Lots of velvet ropes, informed tour guides with great anecdotes and then exit out the front door. Gift shop somewhere else. Nobody expects younger students to remember much, except certain rooms were named after colors as the tour guide explains historical bits about torcheres, presidential candelabras and first lady portraits. The White House at Christmas is a magical place that will mark their first holiday as the First family as a special one. It is also when a tremendous amount of invites, parties and events take place as the White House is set to its best advantage. The Obamas will find too few days with too many guests vying to land the world's most coveted invitations. 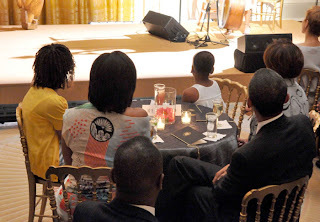 The Obama Family & Mrs. Robinson enjoy the spoken word Poetry event May 12, 2009. Everyone wants to see the Obamas enjoying the house and to reassure themselves there is an abundance of happiness inside. The first outdoor pool party should be coming shortly before they join their dad in the flying White House - Air Force One as its wheels up for the summer. Luci Johnson collected dolls from around the world and the Obama girls have a chance for some international collections as well. White House sign No Tours Beyond This Point, Just as well its the West Colonnade into Palm Room. 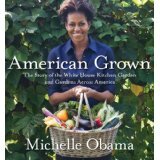 For compelling in-depth historical narratives of the White House, EWR compiled a list of great books & DVDs.